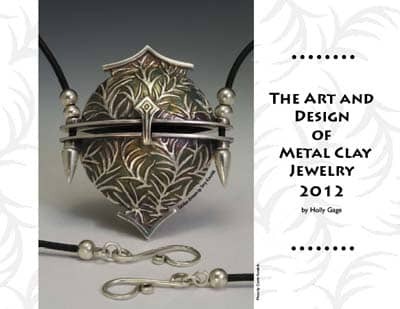 The 5th Annual Art and Design of Metal Clay Jewelry 2012 published by Holly Gage of Gage Designs includes Julia Rai’s work. 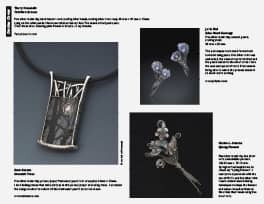 The beautiful 28 page collectors calendar features a variety of jewelry pieces created with silver, rose gold, bronze, copper, and steel from today’s most up and coming Metal Clay artists. Each page beautifully illustrates the diversity, artistry and pure magic of transforming a moldable metal into fine jewelry. It includes pieces mixing a wide range of media, techniques, and levels of complexity — truly an innovative selection. Holly’s motivation for creating the calendar is from the perspective of a metal clay, metal smith, artist, educator, and advocate of this exciting medium, and uses this pictorial diary to show how Metal Clay can enhance the work of a jewelry artisan by adding it to their existing toolbox. Inspiration can be drawn from artist’s statements and websites beside each photo. Throughout the calendar jewelry conferences and competition deadlines are listed to encourage artist participation.